I had heard, never judge a book by its cover, but sadly I failed to understand that the warning includes the cleverly worded blurb too! Till now, I have been selecting books on the basis of short summary printed on the back, but after the present novel, I seriously doubt whether I would ever do that again! 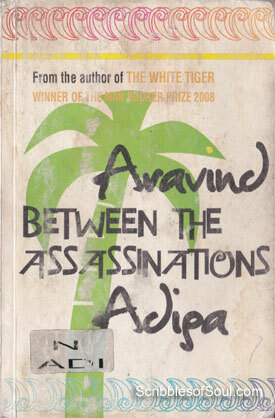 It is not that the blurb was misrepresented or falsely written, it was surely a charming one, and I fell for ‘Between the Assassinations’ written by Aravind Adiga, that promised a moral biography of the citizens of Kittur during the seven year period between the assassinations of Indira Gandhi and her son Rahul Gandhi. However, I jumped to conclusions too soon and expected a cheeky political satire, something to do with the assassinations of prominent leaders or at least, a similar precept. So, despite my sincere efforts, I approached the novel with a predetermined bias. To give author due credit, he began the novel on quite an unusual note, giving the exact location of Kittur, inviting the reader to spend a week in the picturesque small town, for a minimum of one week. And, then in the true itinerary style, the first day was dedicated to Train Station, where a Muslim boy suffers from hunger pangs and unexplained caste complex. Deep rooted, ill founded rage makes the boy a potential victim for an Islamic terrorist. At this stage, I was reading the novel at a very fast pace, waiting for something to happen, related to assassinations. But, to my great dismay, nothing happened, and the writer simply progressed onto the second day of his itinerary, telling the story of a rich Muslim businessman, who derives nefarious satisfaction by making corrupt officials drink his body fluids! And, then began the third story about a Dalit man, who is beaten by a policeman for selling counterfeit banned books. Now, I began to feel slightly jaded. I could hardly understand the plot and the stories seem to just focus on unwarranted anger, unsolicited bias and unexplained injustice. As if to prove my hitch correct, the next story focused on caste politics, where a directionless boy explodes a bomb in his college. The stories continued, with an unsocial/antisocial protagonist, who finds it hard to gel with his neighbors, colleagues, masters or community. And, with each progressive story, I found another rebel ready to thwart society, attack his superiors or flout the laws, for the heck of it. It was at this point, that I realized Adiga and I were running towards opposite poles! The novel has indeed nothing to do with assassinations. It is not a political satire, though, it does parodize ill founded beliefs of a certain section of society. I thought, that now I have cracked the code of the novel. It is simply a collection of twelve stories, spanned during the seven day itinerary, interspersed with dry demo-graphical data about Kittur, which I found rather irksome than informative. Perhaps, the author has tried to create a negative Malgudi, where each citizen is malicious, angry, frustrated, ready to out caste people who dare to think differently. But, sadly Kittur came across as no Malgudi. Despite strenuous attempts, I could not visualize Kittur, or decipher any connection between the protagonists, their ideals or agendas. Individually, the stories were not that bad. Despite their negativity, one or two managed to entertain me. But, it was primarily the structure of the book that I found too shaky. In an attempt to gel a collection of stories with a novel format, I think the book ended up in no man’s land, confusing the readers and writer alike! But, in the last story, Aravind did a complete somersault. He introduced Murli, a frustrated Marxist Brahmin, who nurtured the hope of being a writer in his young age, but was discouraged, as his protagonists were too satisfied with their mundane lives! The last story reversed my entire outlook. I thought that Murli may be a possible composer of these stories. Perhaps, the character sketches are indeed written by him, and altered into negative ego, when he is shooed off by the low caste girl, he falls in love with, at the age of fifty five. But, then I realized that I am again making a hypothesis, as I did at the beginning! So, in a way, I was back at square one, after spending three days in the company of queer kittur residents. To complicate matters further, the book ended with a chronology of events, ranging from 1984 to 1991, forcing me to re evaluate my understanding, leaving me feel like a hapless child, who was tricked to endure the endless galleries of an archaic museum, with the promise of an exciting video game at the end, but the reward turned out to be nothing but a replay of the weary grand tour!